The possibilities are endless with the Bloem Milano 21 in. 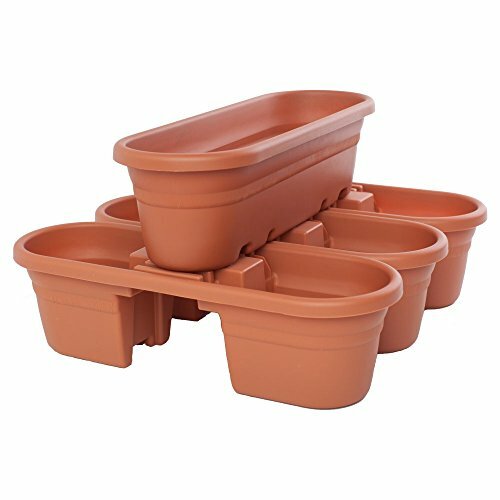 Rail Planter - Terra Cotta - Set of 4. You’ll get three rail planters and one modular planter with this set, all crafted of durable polypropylene that can be used indoors or out. The rail planters fit onto any four- or six-inch rail, or they can sit right on the floor. In a classic terra cotta finish. Made in the USA. Bloem is based in Hudsonville, Michigan. Their mission is to add color and life to indoor and outdoor living spaces with vibrantly colored planters, decor, bird baths, and more. Their colorful BloemBagz line is crafted of fabric and recycled bottles made into flexible and stylish bags that are perfect as planters for flowers, fruits, vegetables, herbs, and more. They're also versatile enough to be used as carry-all bags or fun storage bins. Bloem manufactures their gardening products in the USA. Set of 3 rail planters and 1 modular planter. Durable polypropylene in terra cotta finish. Rail planters fit any 4- or 6-inch rail. Indoor or outdoor use. Made in the USA. Each: 21L x 7.25W x 5.75H inches.